* Scroll to bottom for photos. * All R&D is now complete. * Includes finance and amortization. * Scroll down for photos. 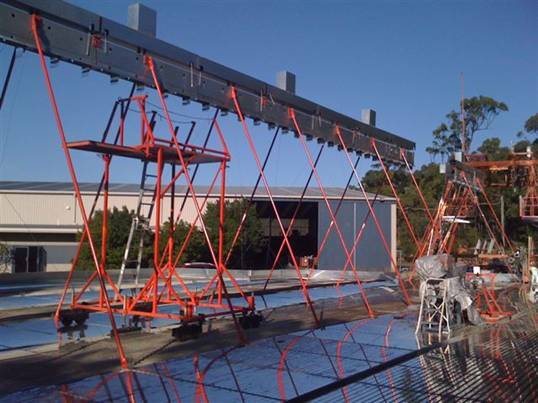 In the YEOMANS FLOATING SOLAR system, sunlight is concentrated 180 times using two sequential parabolic trough systems. Each 7,800 square metre unit, has its primary concentrating mirrors set into rigid floating concrete pads. These mirrors cannot flex and they’re indestructible. The modular pads are assembled in shallow ponds. The primary mirrors then focus onto 320 square metres of secondary mirrors that focus on small single collector tubes. The floating array moves to align with the sun. 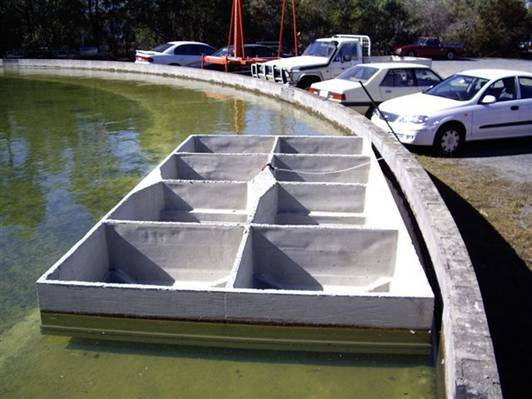 For hail and storm protection the array can be flooded to sink down under the pond water. After initial filling and commencement of operations, no further water is needed; ever. Capital cost are reliable estimated to be around one third that of conventional solar towers and parabolic trough systems. The system is designed to flash form steam at up to 600 deg C and 100 bar (1500 psi). The design and the costing includes, salt thermoclines or hot and cold tanks for overnight storage, and backup power for extended sunless days. Is this what you have been looking for? Our contact details are below the photos. Our current costing shows capital costs for midday sun in the low latitudes to be as low as $1,500 per kilowatt hour heat equivalent of electricity generated, so for 24 hour, year-round power production, capital costs for free solar energy power equate to $6,000 per kilowatt hour. The complete solar thermal system including the turbo generator and heat storage for overnight power production along with backup auxiliary power for extended periods of sunless days assures continuous power with no requirement for connection to the grid. Depending on location, amortizing capital and interest payments are expected to range 2 cents either side of 10 cents per kilowatt hour of electricity generated. We maintain that electricity could be sold at a wholesale price at well under 20 cents per kilowatt hour, and be available on a 24 hour, 365 day basis. Development work on the Yeomans Floating Solar System is now complete. Numerous patents have been granted and more are pending. All major countries within 40 deg latitude south and north are covered. The design has the high temperature advantage of solar tower systems but not their engineering and optical disadvantages. The design also has the practicality of trough concentrators but is not restricted by the engineering limitations for commercially practical optics. Nor does it require the use of exotic high temperature oils to convey heat to an additional steam generator. The system’s optics are unique in that the sunlight is concentrated through two concentrated sequential parabolic trough configurations. This gives peak sunlight concentrations of approximately 180 suns. The small secondary parabolic troughs focus on a series of compact individual collector tubes. Steam is flash produced at 75 bar and over 500 deg C (1,000psi and 930 Fahrenheit). System trials have actually been conducted satisfactorily at 150 bar and at 675 deg C (1500 psi and 1250 F). 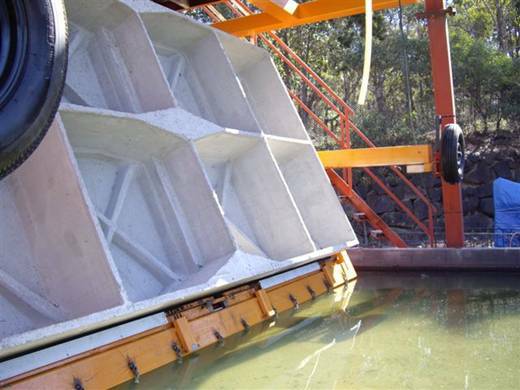 The primary mirrors are pre-cast into 4.8 metres square floating concrete modules. Our factory test tank unit is a 35 module configuration . Each mirror is 1200 millimeter by 75 millimeter (approximately 4 foot by 3 inches) and 2 mm thick. 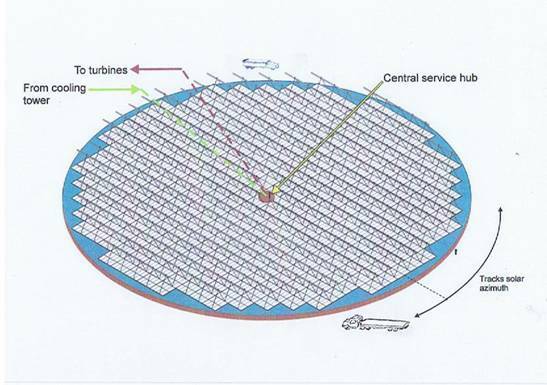 In a one megawatt nominal production unit (approximately 330 kilowatts at 24/7 delivery) there would be 350 interconnected modules in a 110 metre diameter pond. It would contain 7,700 square metres of primary mirrors. The 350 modules would be configured to form 21 parallel Fresnel parabolic troughs. 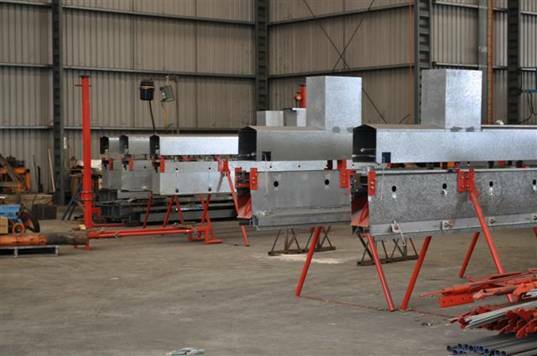 Our factory test unit has seven such trough configurations. The ponds containing the mirrors becomes the solar field. It would have the appearance of a 110 meter diameter football field surrounded by a three foot or 900 millimeter high, brick fence. Floating in this pond, and almost covering the entire water surface are the 350 inter-coupled individual modules. A simple single drive moves the assembled array to follow the sun’s azimuth. We maintain it is the most simple and by far the cheapest of any solar optical focusing and energy collection system ever devised. The final collector tubes are 250 mm (10 inches) long and 35 mm (1½ inches) diameter. Their mounting is such that they can be removed and replaced in minutes. The process is similar to changing a light globe. Changing collector tubes used in conventional parabolic trough is usually fraught with problems and effects power deliveries. Not so with the Yeomans collector tubes. They can be changed at any time, even in bright sunlight, and with the tiniest, almost immeasurable hindering of electric power production. 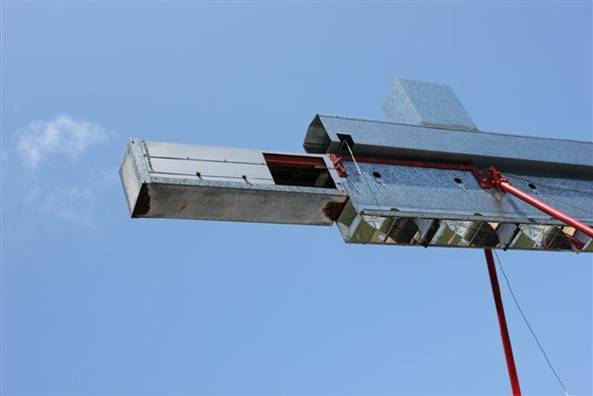 There is minimal heat loss from re-radiation and convection from the extremely compact nature of the solar collector and steam generating tubes. A patented and improved conventional salt thermocline and salt storage tank system will be included to achieve 24 hour operation. 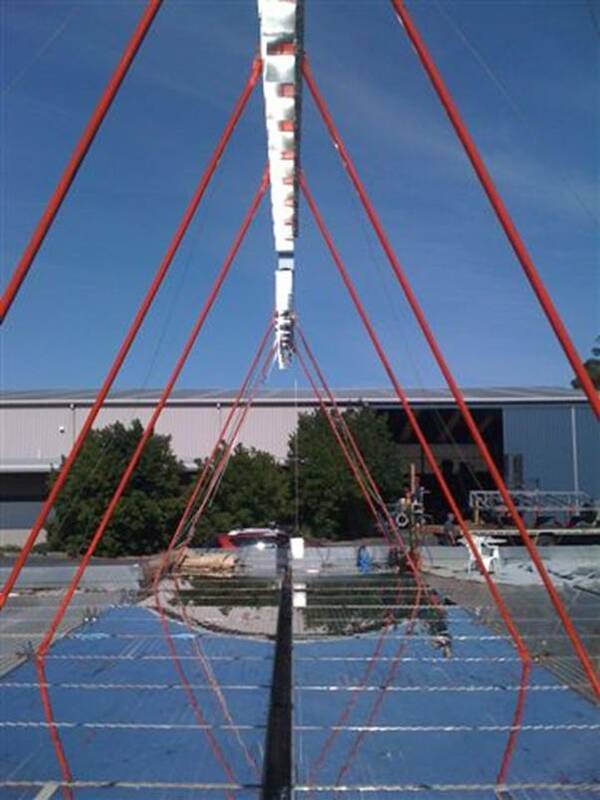 Salt thermoclines admirably suit the Yeomans Floating Solar System because of the high temperatures available from the system. Evaporation losses from the pond are zero. The floating primary mirror spread entirely covers the surface of the water. So pond water is never exposed to the air and wind. No cooling water required as the assembly includes its own internal steam condensation system. The pond itself becomes its own “cooling tower” by a combination of air cooling of the primary mirrors and infra red radiation from the glass surfaces. This concept is also patent protected. A simple golf-buggy type cleaning machine for cheap and rapid primary mirror cleaning solves the mirror surface cleaning problem. It could be driven, and operate and clean the mirrors even in the midday sun. And power production is unimpeded. Walking over the Fresnel primary concentrating mirrors does no damage what-so-ever. Cleaning pads and brushes don’t damage the primary mirrors. And hail and strong winds, what happens? Nothing. The system is virtually immune to weather damage, a virtue unique to Yeomans Floating Solar. Hail and violent wind is a huge potential damage risk for large scale solar power systems. Imagine the insurance bills and what that does to the price of the power. Hail damage is rarely if ever mentioned in solar energy promotional literature. Likewise the “safe wind speed” usually quoted is invariably way below what could be sensibly expected in today’s irrational weather. And because of climate change, these risks are now becoming frighteningly unpredictable. The Yeomans Floating Solar system solves those problems. To be safe we devised two systems for covering the mirrors and anchoring the system down from blowing away. 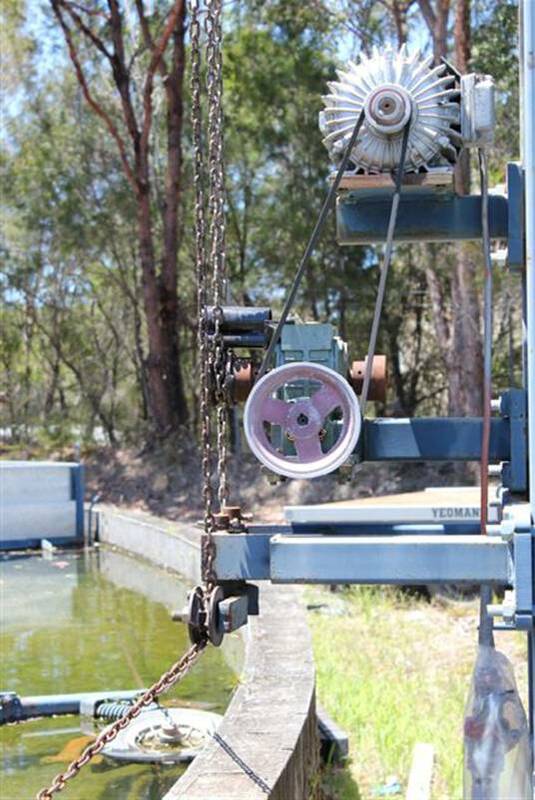 A low lift, high volume, irrigation type pump floods the primary mirror array by pumping the support water from under the mirrors up and onto the top of the mirrors. The entire system then sinks to the floor of the pond. And the operation takes just a few minutes. After the risk passes the pump is switched off. The flood water leaks back under, and the array resurface. When the sun reappears, full steam production can restart in minutes. Alternatively a now released and patented system whereby each pond in sequence is stepped slightly below its neighbour has been designed . An agriculture type irrigation flood gate is opened on the highest pond, and huge quantities of water cascades down over all the lower ponds protecting the vast area of primary mirrors from both hail damage and weighing the array down to beat strong wind gusts.. The mirrors cannot be damage by 6 inch hail stones. This has been effectively proven in tests with ice blocks 150 mm (6 inches) in diameter, and dropped from great heights. We understand that 6 inch or 150 mm diameter is bigger than any hail stone size ever recorded anywhere and any time. That is why 150 mm was selected for the tests. Similarly, when the system is flooded, high velocity storm winds present little risk. The secondary mirrors face down and are thus protected. They can never see hail stones. They are simply never exposed to the effects of either hail or storm winds. Weather insurance would be negligible, but if demanded by financiers, it would be relatively insignificant. Think about it, solar energy weather damage is suddenly not a problem. 20 cents per kilowatt hour. 2 Integral internal backup power insures 365 days and 24 hour power production. 3 Not susceptible to violent weather events. 4 No cooling water required. 5 No expensive high technology mirror system. 6 As the mirrors are set in concrete, the common problem of mirror flexing with its resulting optical distortions is virtually impossible in this system. 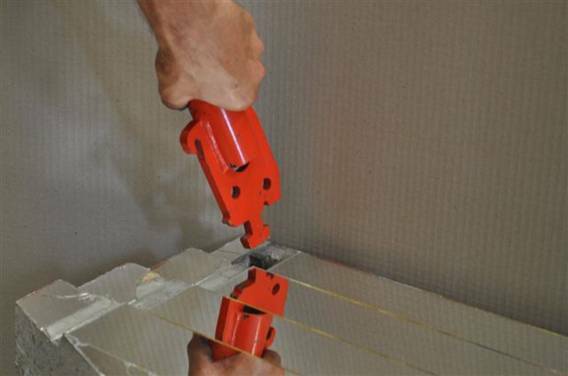 7 Simple maintenance and easy collector tube replacement. 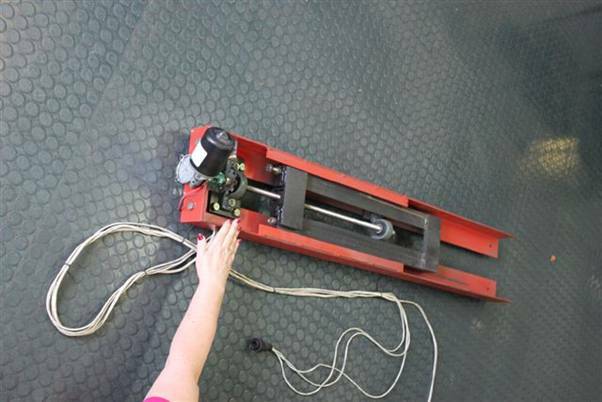 6 Mirror cleaning can be accomplished using ordinary floor cleaning machines. 7 Research and development complete. 8 Granted patent coverage already established in solar-suitable countries. Individual modules are 4.87 metres square (16 feet) and comprise two concrete castings pinned togeather. One is shown. They are cast upside down and the concrete is given seven days for initial setting before turning right side up. In each there is one cubic metres of ordinary concrete. Concrete pad being revolved in roll over gig. Showing underside. Concrete being revolved in roll over gig. Showing top mirrored side. Secondary concentrators being assembled. These hold the collector tubes. The upper insulating box holds the water supply pipes and the steam delivery pipes. Assembled units. Also showing a mobile work platform that gives quick access to secondary mirror system and collector tubes. 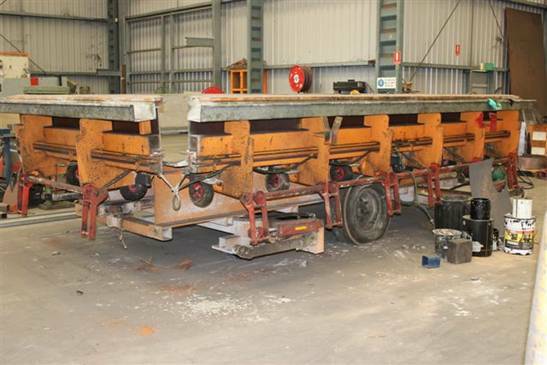 Platform can safely be rolled over primary mirrors surfaces. The system being moved and shown just prior to full azimuth alignment. This shows the center drainage gutter used when cleaning. It’s also where the flooding water finally drains through after hail risk has passed. .
COLLECTOR TUBE Three square metres of primary sunlight is focused and absorbed into each Collector Tube. Within each tube water is flash formed into super heated steam at 70 bar (1000 psi) and 500 deg C . The Collector Tubes are clipped into place and if ever damaged can be removed and replaced in minutes. Sonnecorp www.sonnecorp.diytrade.com in China make these tubes for us. They make conventional tubes for both concentrated solar thermal applications and for hot water syatems. And they’re good. Illustration of a one megawatt pond. Semi-trailer shows size comparison. Pond would power 330 homes, 24/7 with thermocline salt storage. from a six cylinder petrol engine. 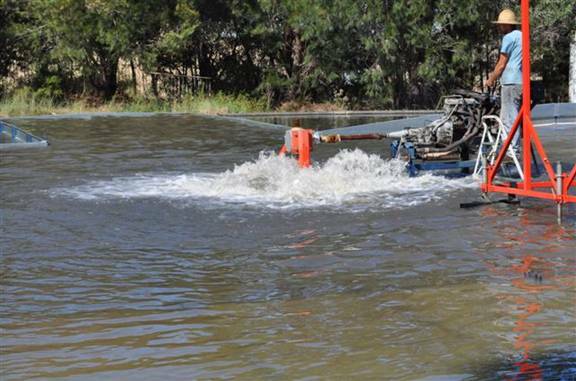 Flood pump in use sinking the mirror array. Test drive unit for azimuth control. 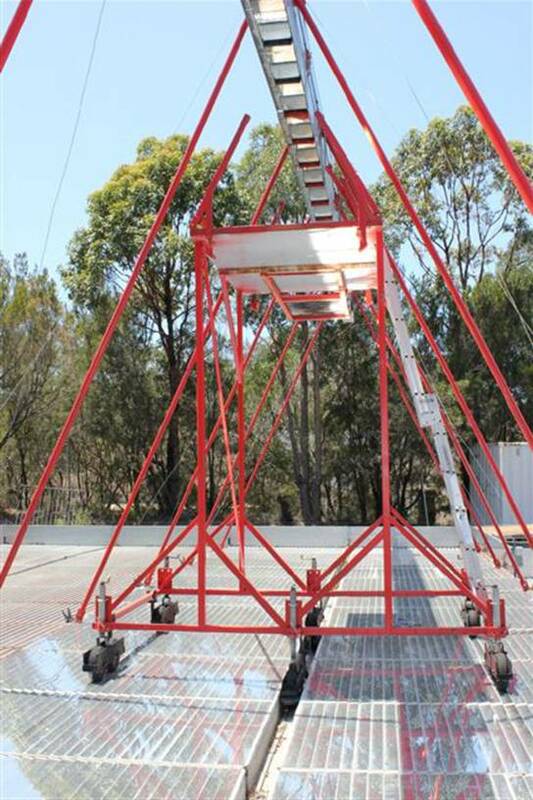 Unit shown is all that is necessary to control a 110 metres diameter mirror array with 7800 square metres of primary mirrors producing a solid one megawatts of electricity. 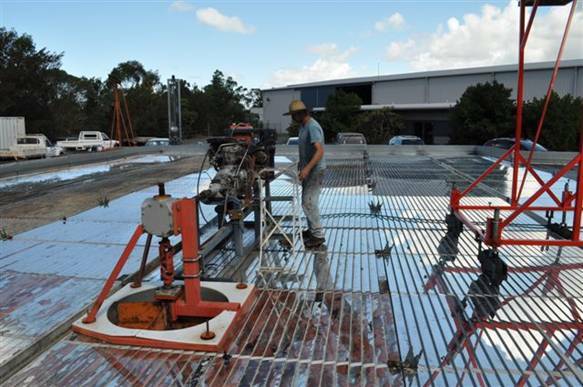 cater for the 7,800 square metres of primary mirrors. Secondary mirror control shown in its housing. Concrete mold. The floor of the mold is 50 mm plate, stress relieved and very accurately machined to take the mirror strips. The strips are inserted prior to pouring the concrete. Concrete is standard commercial building quality. Lower end of the vertical support legs clip into galvanized supports, pre-set in the concrete. 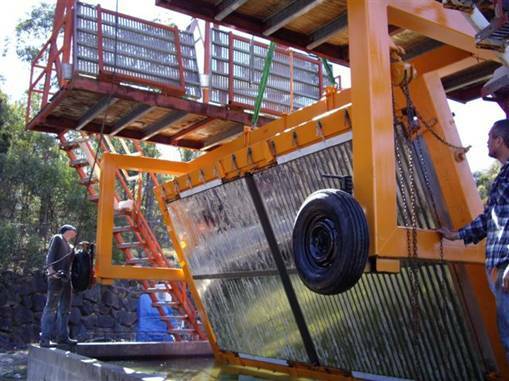 With the Yeomans Floating Solar system everything is easy, very low cost and practical. or Google: Yeomans Plow or Allan Yeomans, and we come up)..
It’s a totally new and extremely practical concept in concentrated solar power and people are now saying that it’s by far the cheapest system in the world to day. # 15 cm hail stones no problem. You flood it. # 250 kilometer winds no problem. You cascade flood the modules. # Including capital costs, interest and deprecation it’s about one third the cost of diesel generated power. # Cleaning is easy, simple and fast. You just use a modified road sweepers and drive over the floating mirror array. Our costs show that a complete one megawatt power generating modular system. set up to operate 24/7, will, at most, cost around $12,000 per kilowatt. Looking at it another way, and depending on location, total costs vary around US$350 per square metres of primary mirrors for 24/7 operation. And it’s all ready to roll, right now.